An orchid mantis (Hymenopus coronatus) perched on an orchid. Indigenous to southeast Asia, it mimics a pink orchid in color and texture. It remains motionless on the flower until prey arrives, and then strikes. Photo (cc) Luc Viatour (www.Lucnix.be) available at Wikipedia. Most people are familiar with some forms of camouflage as it's used in nature or by the military. The idea usually relates to disguising or cloaking a physical entity so as to make detection difficult. In nature, camouflage often takes the form of protective coloration. Military applications involve similar techniques, but there are also more sophisticated disguises. Military theorists recognize two classes of deception. Passive deception disguises an existing capability, facility, or intention. Active deception makes a non-existent capability, facility, or intention appear to be real. At work, deceptions of all kinds are often a tool of politics. Applying what scientists know about deception in nature, and what military theorists know about deception in war, we can gain new insights into its use in workplace politics. Here are two examples of deceptions in workplace politics that employ passive camouflage. The black and white coloration of killer whales exemplifies what's called disruptive coloration. The color pattern contradicts the whale's body shape, which gives it an advantage. In the often-uneven light of the subsurface marine environment, other animals might not recognize the killer whale until too late. In preparation for downsizing, managers must select projects for termination from among projects underway or planned. In some cases, sound decisions require project status reviews that are either sudden or beyond the routine review. If these reviews occur only in preparation for downsizing, conducting them sets off rumors that could trigger an unwanted exodus of employees who believe that they're about to be terminated themselves. Making such project reviews routine prevents them from being seen as a signal of downsizing. With respect to project reviews, such a practice disrupts the boundary between normal operation and preparation for downsizing. into its use in workplace politicsmimesis is mimicry. In the context of camouflage, the flower mantises, which mimic flowers, provide good examples. Typically, flower mantises position themselves on a plant and hold still, or slowly sway back and forth, mimicking one of the plant's flowers, until an insect lands close enough to be caught. 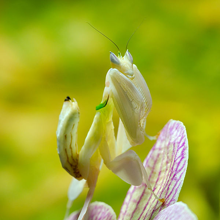 Some flower mantises have dark spots on their bodies that act as decoys for actual insects. In reorganizations, there is sometimes a need to ensure orderly transitions of responsibilities from employees who will be discharged. To ensure that they won't depart before the transition of their responsibilities is complete, and to ensure that they'll cooperate willingly, these employees are sometimes assigned fictitious new responsibilities. Convinced by this mimicry that they can rely on continued employment, these employees remain in place, carrying out their new assignments while they're being debriefed about their former assignments. When the debriefing is complete, they're discharged, and the fictitious efforts that held them in place are terminated. Would you like to see your comments posted here? rbrenBHOmCOLqQmlWwBSrner@ChacSjGrKDPOoqIirVZeoCanyon.comSend me your comments by email, or by Web form. I offer email and telephone coaching at both corporate and individual rates. Contact Rick for details at rbrenJtMPcThDeSRtKSWgner@ChaccCPpHAnNFbZBQncZoCanyon.com or (650) 787-6475, or toll-free in the continental US at (866) 378-5470.